It's an elegant weapon, one of the most iconic weapons in science fiction: the lightsaber. But we know you have questions. How do lightsabers work in the Star Wars Universe? How do they work in real life? 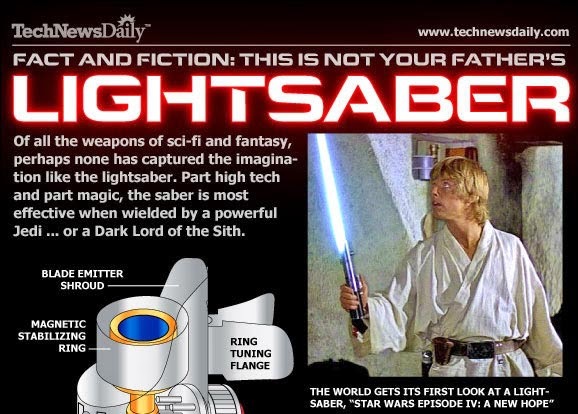 Could we ever have real lightsabers? All these questions and more are answered in this cool infographic by Tech News Daily. And looks like Real Genius wasn't that far off with the lasers. Somebody has too much time on their hands... I love your awesomely geeky posts! We do Sam, but we have to approve them. Thanks for the link! Can't stop thinking on light sabers for my dwarves. Then raiding villages would be more effective. Glad you found the site, I highly recommend it.